The MT Series is a manual test stand for force measurement applications up to 500 lbf (2.5 kN) capacities. The test stand can be bench mounted, wall mounted, or positioned horizontally. 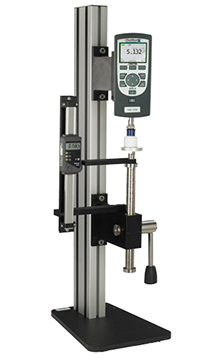 The Chatillon MT Series manual test stand is a flexible, easy-to-use solution for force measurement. It comes in two versions: the MT150 with a 150 lbf (660N) capacity and the MT500 with a 500 lbf (2.5 kN) capacity. The 150 mm (6 inch) throat makes the MT Series excellent for testing large specimens, and the removable plate is designed to accommodate metric as well as imperial threaded fixtures. This manual test stand is ideal for tensile testing, compression testing, peel, and flexural testing. It may be equipped with a quick-action lever or precision hand wheel for controlling crosshead speed and travel. The MT Series manual test stands are often used with the DFX II force gauge to check the force necessary to depress a button, or with the LG mechanical gauge to perform low range pull tests at the end of a production line where caps are placed on spray bottles. They are also used to test the force necessary to fold a cardboard container into proper shape. Request more information to see how we can help you with a manual test stand solution that suits your need. Find the Declaration of Conformity for the MT Series test stand here.